The Google Pixel Slate is finally available - to pre-order, at least. Google's 2-in-1 gadget aims to meld the convenience of a modern Chromebook with the portability of a slim tablet. 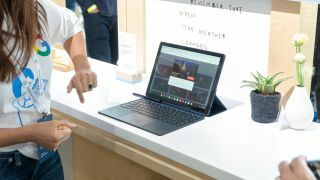 The Google Pixel Slate is available in five configurations, from a basic 32GB tablet with Intel Celeron processing and 4GB RAM, to a more advanced model with 256GB storage, an Intel Core i7 processor, and 16GB RAM. All models feature the same Midnight Blue design, while prices range from $599 / £549 to $1,599 / £1,549. For all the talk of convenience, though, buyers will almost certainly need to purchase the add-on keyboard for $199 to make full use of the Slate - if not the $99 Pixelbook Pen as well. All signs point to a release date before November 23 - or Black Friday, as you may know it - in order the make the most of the seasonal sales. With the Slate only just having gone on pre-order, though, we may see it land pretty close to the finish line. You can check out the latest UK Black Friday laptop deals or US Black Friday laptop deals in our extensive round-up pages. Google's own retail page specifies a two-three week wait for the Slate, while Best Buy in the US plans to ship out as late as November 22. We're unlikely to see a Black Friday discount, really, for a product that's only then going on sale, but the Google Pixel Slate could shift a good few units given its likely release date.